Welcome to the Old Dominion University quillwort page! The page has been redesigned. To search for a quillwort go to the ODU Plant Site and type in the name of the taxon you are looking for. Here is a sampling of some of our research during the past twenty-five years. Quillworts of Southern Africa Data from collaborative research on the genus Isoetes in Southern Africa is located at this site including the spectacular green-spored quillwort! 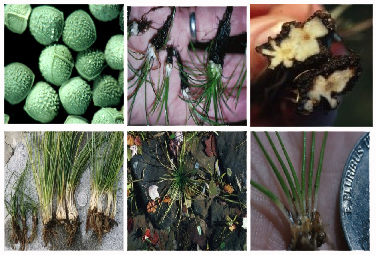 Syrian Quillwort Poster Research on Isoetes olympica, threatened with extirpation by expanding agriculture, is here as a poster presented at FERN FLORA WORLDWIDE: Threats and Responses, June 2001, University of Surrey. I searched for this species at the type locality, Uladag near Bursa, Turkey and could not locate any extant populations due to extensive development of snow skiing resorts. Quillwort Poems The poet who wrote these is a leading field botanist of the Southeastern United States with a facile pen. Fieldwork in Lebanon has added considerably to our understanding of the distribution of Isoetes species in the Eastern Mediterranean. This short paper documents the presence of Isoetes duriei in northern Lebanon, a considerable extension of its range.